In 1989, a film adaptation of Shakespeare's Henry V appeared. At not quite 29 years old, Kenneth Branagh both directed the film and starred in the title role, King Henry V of England. Henry V is the story of the English King’s attempt to invade France and join its crown to his own. Based on the Shakespearean play, Branagh’s movie focuses on Henry and the many advisors and potential traitors who orbit around him as he makes decisions leading up to the Battle of Agincourt. There is conflict between the church and state. Powerful leaders in the church, including the Archbishop of Canterbury played by Chares Kay, essentially move Henry toward war with France, in part to keep him from making political moves that might usurp some of the church's power. The film also shows some of the political ramifications after the battle, including a treaty that is negotiated while Henry, now king of both countries, woos the French princess who will become his wife. Besides Branagh, several other notable British actors play key roles. The renowned Derek Jacobi acts as the Chorus who helps to narrate the tale, while jovial Brian Blessed plays the Duke of Exeter and Ian Holm is Fluellen, one of Henry’s important officers. Judi Dench plays Mistress Quickly, with the great Paul Scofield taking on the part of Charles VI of France. A young Emma Thompson, who was married to Branagh at the time, plays Katharine, the French princess whom it is hoped that Henry will wed. Robbie Coltrane plays Falstaff, an old friend of the king's. The memorable battle scenes show the English using their long bows against the French mounted troops. Henry stirs his outnumbered troops to heroism with the famous St. Crispin's Day speech. 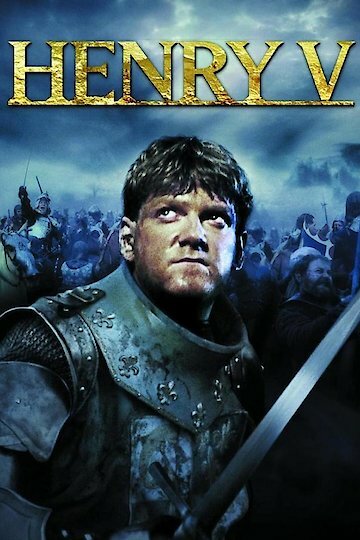 Henry V is currently available to watch free on Tubi TV, The Roku Channel, Vudu Free and stream, download, buy on demand at Amazon Prime, Vudu online.